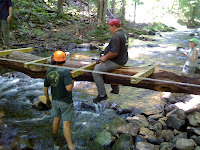 The Mohican Outdoor Center (MOC) Trail Crew 2009 season was another season of great feats and fun on the trails of the Delaware Water Gap National Recreation Area in NJ & PA. The crew put in over 4,000 volunteer hours with almost 90 volunteers between April-November. There also were a significant amount of first timers that couldn't help but come back for some more! 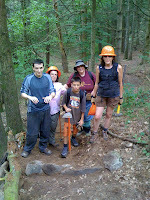 This year the MOC Trail Crew mainly focused on Adams Creek Trail, Coppermine Trail, and Toms Creek Trail. 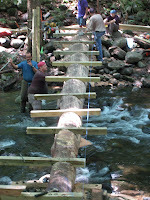 Their largest project was building a new 37 foot span bridge across Adams Creek. Each year the Crew does an amazing project similar to this. On Coppermine Trail they reconstructed & reinforced the stone footings for the Coppermine Bridge, replaced bog bridges, and redefined the entrance and trailbed. It is now much easier to see where the Coppermine Trail branches off from the Appalachian Trail. Thank you! The Crew also completed trail assessments at the beginning of the season and rebuilt Tom's Creek Trail's trailbed & rehabbed a culvert. Beyond all the Mohican Trail Crew's hard work out on the trails they a lso know how to reward their volunteers with great food especially in November. November is the last month of the Crew's season where all the volunteers who have put in at least 20 hours feast on a fine Pre-Thanksgiving meal. See for yourself!